How distant my Swabian* youth seems now. Not far, but yes, it carried me! I soared! that the laurels don’t go to the meek or the bashful. but where had they gotten us? I liked his enthusiasm and optimism. restored the Sudetenland and Danzig. strike quickly; do the unexpected. The African war agreed with me. lacking in hilly, forested Europe. as the height of genius, military. turning and stinging at Agedabia. El Alamein: the Fuhrer and I part company. “Victory or Death”, he cabled me. I disagreed: my men would not die senselessly. We were desperate for gasoline. Ship after ship was sunk trying to deliver it. We were outnumbered five to one. The Fuhrer wouldn’t hear of it. I flew to East Prussia to confront him. but the war as a whole would be lost. The weight of the forces against us was crushing. The only question’d been their willingness to fight. That had been answered at Stalingrad. But now that we’ve failed, our destruction’s inevitable. don’t let our country be overrun by Russia. though, yes, I knew of it . . . after a fashion. . . . Defending myself to that group would be hopeless*. . . .
the humiliation of hearing me declared a traitor. always with the troops where the battle was most critical. dared to act when others shied away. scourge of the British military. but only when outnumbered overwhelmingly. waiting to take a cyanide pill. Were we right to force our rule on other people? Icarus-like, we flew too high. in the end, not supermen. Swabia: A region of southwestern Germany (around Stuttgart) which had been a dukedom in the 10th to 13th centuries. glider: In 1906 Rommel, age 14, and a friend built a full-size, box-type glider. General Staff: High-level officers with formal military education. Rommel, having come up through the ranks, lacked such training. no doubt: Rommel was correct in thinking that the British knew the exact destinations and sailing times of Italian supply ships, but was wrong as to the source of their information: it was coming from German (“Enigma”) radio transmissions which the British had learned to decode. beaches: Rommel was in charge of the defense of the coast against British/American invasion. Bir Hacheim: A fort at the southern end of the “Gazala Line” (in Libya) which Rommel outflanked in his attack upon Tobruk in 1942.
hopeless: The army’s Court of Honor (Field Marshal Keitel, Generals Guderian and Kirchheim) had been presented with evidence of Rommel’s involvement in the plot on Hitler’s life (false) and his attempts to arrange an armistice with the British (true). 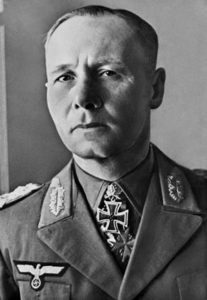 With Hitler’s approval they had given Rommel a choice of committing suicide (and having his treason hushed up) or of going before the court (and, no doubt, being hung in public). Opel: The car which the officers who presented Rommel with his choices had driven from Berlin.